Tekst Unique. Playable at Dol Amroth. May not be attacked. 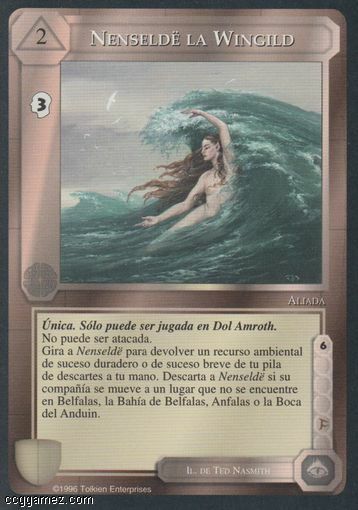 Tap Nenseldë the Wingild to return one environment resource long-event or short-event from your discard pile to your hand. Discard Nenseldë the Wingild if her company moves to a site that is not in: Belfalas, Bay of Belfalas, Anfalas, or Mouths of the Anduin.